Calibration compliant with the DICOM Part 14 standard. Superior cost performance monitor featuring widescreen format with 16:10 aspect ratio gives you more horizontal space. 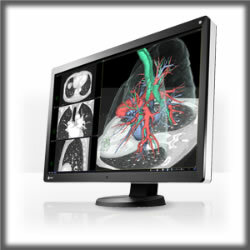 The RadiForce MX270W features a 27-inch large screen size and a 2560 x 1440 high-resolution which are ideal for displaying multiple imaging applications or windows to improve the work efficiency of physicians and radiologists. Featuring high definition, high resolution and multi-grayscale, this 5 megapixel monochrome monitor is designed specifically for displaying digital mammography images. With its widescreen format, the GX1030 is an optimal replacement for traditional dual head 5MP display installations. The consistent color point and bezel-less configuration of a single monitor serve to reduce eye fatigue for the radiologist while lowering the administrative and QA costs for the operator. With the unobstructed viewing space, applications can offer greater hanging protocol flexibility for richer comparisons between past and present images.